Recommended intake: Adults: One or two softgels daily or as recommended by your physician. 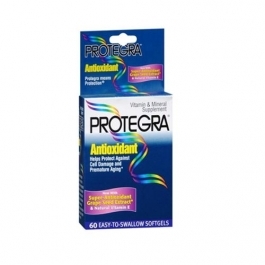 Protegra can be taken by itself or with a multivitamin. Per Softgel: Vitamin A (100% as Beta Carotene) 500 IU; Vitamin C (as Ascorbic Acid) 250 mg; Vitamin E (As dl-Alpha Tocopheryl Acetate) 60 IU; Zinc (as Zinc Oxide) 7.5 mg; Selenium (as Sodium Selenate) 15 mcg; Copper (as Cupric Oxide) 1 mg; Manganese (as Managnese Sulfate) 1.5 mg; Grape Seed Extract (85%-95% Proanthocyanidins) 50 mg; Soybean Oil USP; Gelatin NF; USP Purified Water; Sorbitol NF; Glycerin USP; Hydrogenated Vegetable Oil NF; Yellow Beeswax NF; Lecithin NF; Artificial Colors (FD&C Red #40; FD&C Yellow #6; FD&C Blue #1; Titanium Dioxide); White Edible Ink.